You’re diligent with your carpet. You vacuum it every day and the kids know to keep food in the dining room. Unfortunately, due diligence cannot stop every stain. Accidents still happen, and you need to be prepared for them. Here are some of the most common carpet stains, and what you can do to pull them out of the fibers and make sure your carpet is truly clean. The red coloring in fruit punch and other juice drinks can leave a permanent mark. However, even white carpet can be saved from the telltale red stain. After the drink has been blotted up as much as possible, mix up a solution of ¼-cup white vinegar, ½-gallon of water and a tablespoon of Dawn dish soap. Put this solution in a spray bottle and spray the area liberally. Let it soak in and then start blotting the stain up again. Even a perfectly house-trained can have an accident in the house if left alone too long or there is an illness. While you may understand that accidents happen, you’re also desperate to fully remove both the unsightly ring and the odor. White vinegar should be at the top of your list because it breaks down the proteins and removes the odor. Start by blotting up the stain to remove all moisture. If it’s already dried, then moisten it with the vinegar, water and Dawn mixture detailed above. Continue blotting until the stain is removed. If the smell persists, then you can also sprinkle baking soda over the soiled area. Mix ½-cup of hydrogen peroxide with Dawn dish detergent and pour this over the baking soda. Work it into the stain gently with a scrub brush or sponge. Let it dry and then vacuum away the residue. Your kids are banned from taking drinks in the living room, but your spouse had a little accident with the coffee cup. Before you start a major fight over it, remind yourself that even coffee can be removed. The same Dawn mixture will effectively remove this stain. 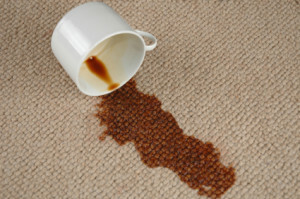 You can also use over-the-counter treatments like Spot Shot or Shaw carpet stain treaters to remove the coffee stain. That pen that fell on the carpet did more damage than you thought. The tip was open and it’s left a nasty mark on your snow white rug. Start by reaching for the rubbing alcohol. Pour some on a white rag and then use this to blot the stain out. Take care to dab lightly to avoid spreading the stain. Continue soaking rags or even cotton balls with the alcohol and dabbing at the spot until it vanishes. Most common stains aren’t as difficult to remove as you might think. However, most of these processes will take a little time. If you don’t have time to mix up solutions and blot at stains, then call in the professionals at High Quality Carpet. We can treat the stains, remove the marks and leave the carpet looking incredible. In addition to treating stains, we can also clean the entire carpet to restore beauty to your entire home.